Happy Christmas to me! We’re all for practical Christmas presents in my family, and every year, around the start of October, my grandmothers both ask what I’d like for my present. Each year I try to come up with something that they can donate money for me to buy either outright, or which I will supplement to get something that I’d really like, but have been unable to purchase on my own. This year I’d been eyeing up a new mixer, with Kenwood being the front runner as a brand, since I still had my mum’s old early 1970’s model (after she got a new one a few years ago) It still works, but is in rather dire need of a service, so I’ve not really been using it for fear of it blowing up! 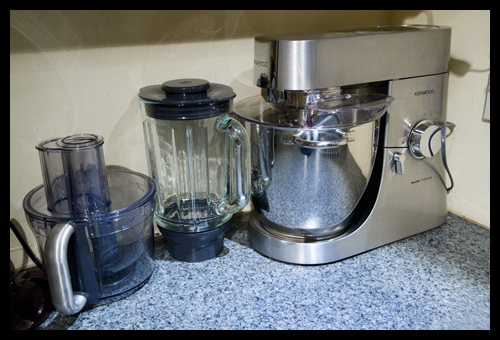 I had also been hoping that I’d get one with a liquidiser, because the blender I have is a super cheap Tesco number (about £10) that I got in dire straights when the one that went with my Moulinex food processor gave up the ghost (it cracked right across the bottom, and being a sealed unit, couldn’t be fixed) Between the food processor, blender and original Kenwood Chef cluttering up my worksurface, I realised that if there was a way of getting everything in one go, then I could claim back some space! No, my grandmothers were not that generous (I didn’t ask them to be! ), this was a supplemented year, and the reason I have it now is that it is on a great offer right now, and I had an interest free option for 6 months on my newly cleared down credit card which only ran til next week. So, err, I’ve managed to save the grand total of the width of a bag of flour in space (which I know because that’s what happens to be sitting there right now…) Oh, and there’s a huge pile of other attachments I had to find space for in a storage rack *ahem* Still, I can now mix things, liquidise things, food process things, juice citrus, mince things, mini-mill things, and weigh things. ooohhh I might like cooking if I had one of those!! I recently got a new blender because ours broke and I love it. Whirring things up is so satisfying! Hurrah for gadgets – cover? no surely it will be too busy to gather dust! Definitely, it need a super-duper cover. What a great buy. It looks like you need a license to use it. Very impressive! P.S. Yes, it definitely needs a cover or it might get cold! Now that I follow your cooking blog, I can see why this is a necessity! That does look like a very serious bit of kit and of course it needs a cover! A cover would be good. I think you are meant to keep those two big extra bits in the nearby cupboard where they are still handy but dust free and not taking up the space on the top. That is if you have room in the nearby cupboard, mine are packed. Of course it needs a cover. Im insanely jealous of your new mixer. I've been eyeing the latest Kenwood off for a while now and am still debating whether I can afford to get one/whether it would get enough use to justify the purchase/ where the hell I would store it! OOOh nice and of course it needs a cover. Will we be seeing photos of your cooking, blending, liquidising? Can't beat a new toy. Especially a kitchen toy or a sewing toy. Enjoy! Very snazzy, if it lasts as long as the last one it will be a bargain! That is some piece of kit! I love my Kenwood they are definitely built to last so it was not a purchase more of an investment! Definitely in that case it should have a bespoke cover too. you know it needs a cover ………….got to have one ! !